(16/P102) TRENTON – Department of Environmental Protection Commissioner Bob Martin today placed 14 counties encompassing the northern, central and northern coastal areas of New Jersey under a drought warning due to ongoing precipitation deficits and deteriorating water-supply conditions, particularly storage levels in reservoirs. 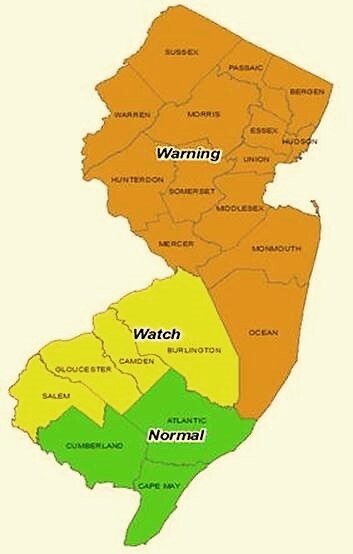 Commissioner Martin signed an Administrative Order designating a drought warning for Bergen, Essex, Hudson, Hunterdon, Mercer, Middlesex, Monmouth, Morris, Ocean, Passaic, Somerset, Sussex, Union and Warren counties. This designation enables the DEP to more closely manage reservoir systems by directing water transfers among systems, controlling releases from reservoirs, and modifying the rate of flow in streams and rivers in order to balance ecological protection and needs of water suppliers. The goal of the drought warning is to preserve and balance available water supplies in an effort to avert more serious water shortages in the future. The warning also elevates the need for residents and businesses in impacted counties to reduce their water use. A drought watch calling for voluntary water conservation remains in effect for Burlington, Camden, Gloucester and Salem counties. The designation of a watch formally urges residents of these counties to voluntarily conserve water. The decision to designate a drought warning comes a day after the DEP held a hearing to update water suppliers and the public. The warning is the first since November 2001, which subsequently became an emergency that was phased in by regions as drought conditions worsened. The emergency was phased out over the latter half of 2002 into early 2003. The Administrative Order signed by Commissioner Martin establishes a formal process for the DEP to work with water suppliers in affected regions to ensure no single water supplier or region faces a significant shortfall should dry weather and high customer demand continue. The DEP has been consulting with water suppliers for months to assess conditions and ensure they are fully aware of the situation and are ready to cooperate with the DEP. Drought and abnormally dry conditions are affecting large portions of the nation, including California and a large swath of the nation from West Virginia into the Deep South and eastern Texas. Parts of Pennsylvania, most of New York State and all of New England are experiencing a range from abnormally dry conditions to extreme drought, according to the U.S. Department of Agriculture’s Drought Monitor. The DEP utilizes indicators to gauge the impacts that a shortfall of precipitation has had on water supplies, including reservoir levels, stream flows, and levels in shallow groundwater sources, known as unconfined aquifers, which is important in the longer-term replenishment of streams and reservoirs. The northern tier of the state, in particular, has been grappling with below-normal precipitation. In this area, precipitation deficits for the past 12 months are as much as 12.7 inches below normal. Major reservoir systems are below their normal levels for this time of year, and will likely need transfers of water through interconnected infrastructure to balance storage. The Northeast Combined Reservoir System – 12 reservoirs operated by four water suppliers serving the most densely populated region of the state – have dropped to 52 percent capacity, compared to a normal of about 67 percent for this time of year. The North Jersey District Water Supply Commission’s two reservoirs have dropped to below 50 percent capacity, compared to a normal of about 68 percent for this time of year. The Commission serves portions of Bergen, Essex, Hudson and Passaic counties. The New Jersey Water Supply Authority’s Raritan Basin reservoirs – serving densely populated central parts of the state – are 25 percent below their normal storage level of 89 percent for this time of year. The Suez-NJ system (formerly United Water-NJ) consists of three reservoirs serving Bergen County that have dropped to less than 45 percent total capacity, compared to a normal capacity of 60 percent for this time of year. The combined storage in reservoirs operated by New Jersey American Water and the New Jersey Water Supply Authority serving portions of Monmouth and Ocean counties are 14 percent below their normal level of 86 percent for this time of year. Sussex and Warren counties rely primarily on groundwater and have been included in the warning because groundwater in this area is rated as extremely dry while precipitation and stream flows are rated as severely dry. The southwestern part of the state – Burlington, Camden, Gloucester and Salem counties – relies primarily on groundwater. Precipitation in this part of the state is rated as moderately dry while stream flows and groundwater are rated as severely dry. In the southern coastal region of the state – Atlantic, Cape May and Cumberland counties – rainfall is near or above normal. Still, stream flow is considered moderately dry. The DEP is continuing to monitor local conditions but at this time has not issued a drought watch or warning for these counties.